1. Make the dough. In a large bowl, whisk the flour with 3/4 teaspoon each of salt and pepper. Working over the bowl, grate the frozen butter on the large holes of a box grater. Gently toss the grated butter in the flour. Stir in 1/3 cup of ice water until the dough is evenly moistened. Scrape out onto a work surface, gather up any crumbs and knead gently just until the dough comes together. Pat into a disk, wrap in plastic and refrigerate until chilled, about 1 hour. 2. Meanwhile, make the filling . Preheat the oven to 425 degrees. On a large rimmed baking sheet, toss the butternut and kabocha squash and the onion with the olive oil and curry powder. Season generously with salt and pepper. Roast for 15-20 minutes, until the squash, is tender but not falling apart. Let cool. 3. Increase the oven temperature to 450 degrees. Place a cookie sheet upside down in the oven and let it preheat. On a lightly floured work surface, roll out the dough to a 14 inch round. Carefully transfer to parchment paper. Spread the sour cream over the dough, leaving a 1 1/2-inch border. Sprinkle 1/2 cup of the cheese on top. Arrange the squash and red onion over the sour cream and sprinkle the remaining 1/4 cup of cheese on top. (You don't need to use all of the squash mixture. Don't make it too heavy). Fold pastry edge up and over the vegetables to create a 1 1/2-inch border. 4. Carefully place the galette with the parchment paper onto the heated cookie sheet. 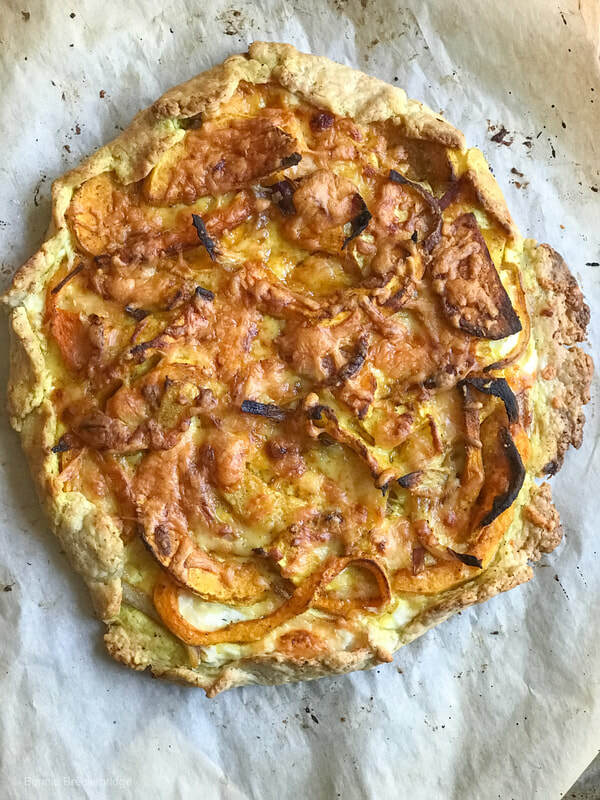 Bake the squash galette for 30 minutes, until the crust is browned; let cool slightly. Sprinkle with shredded cheese, cut into wedges and serve warm.